Starting in the summer of 2014, several Santa Fe Hills neighbors began organizing neighborhood potlucks. We leveraged our ever growing communication network on the Santa Fe Hills Facebook page and Santa Fe Hills Nextdoor to get the ball rolling. The strategy was to organize a new pot luck once a month, rotate to a different Santa Fe Hills park for each new potluck, pass out 150 flyers to the homes surrounding each new park, and encourage new neighbors to join Nextdoor. Our first potluck turned out about 80 neighbors at Quail Valley Park. We then rotated to Valley View Park, Santa Fe Hills Park (with the theme of Playground Balls… and about 100 different balls for kids play with), then to Foothills Park. The strategy and execution was a huge success. 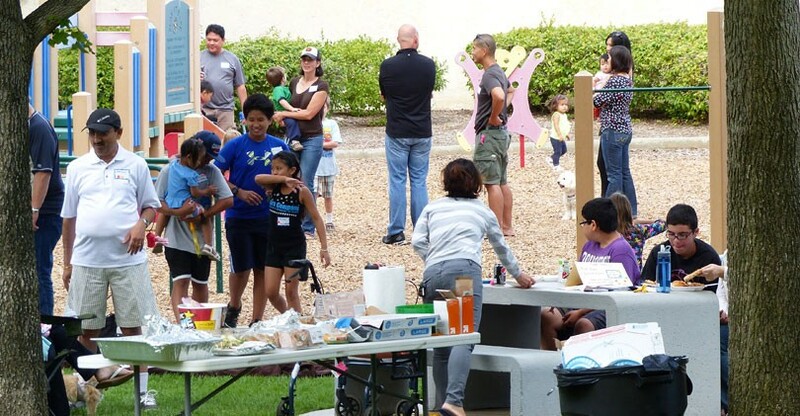 We’ve since grown our Nextdoor network from 400 to 1600 neighbors and many of us have made several new neighborhood friends and activity partners. In between the potlucks, we organized another potluck themed community event at Quail Valley Park named National Night Out. The huge success of this event was even recognised in the Union Tribune. If you live in Santa Fe Hills, stay tuned for more potlucks and community events in 2017 by liking the Santa Fe Hills Facebook page and/or by joining Nextdoor. 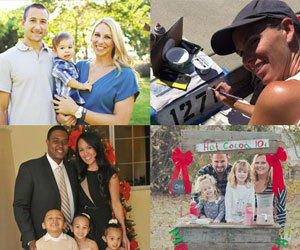 Strong neighborhoods nurture safe, happy families. They also keep real-estate prices stable. Here are 12 fun, proven tactics for connecting with the neighbors. Great neighbors are the answer to a lot of the questions life throws at you, whether you’re tearing out your hair over speeding cars, scared of possible drug activity down the block or just need a cup of sugar or a back-fence friend. “Realtors tell you, ‘It’s location, location, location.’ But really, what makes a great location? Good housing stock, good schools nearby and a neighborhood where, when there’s a problem, it’s solved quickly by the people who live there, and it’s a fun place to live,” says Jay Walljasper, author of “The Great Neighborhood Book: A Do-it-Yourself Guide to Placemaking.” Great neighborhoods, Walljasper says, both support real-estate values and enrich lives. The most visible benefits of close neighborhoods are strong property values, good schools and reduced crime. Dennis P. Rosenbaum, director of the Center for Research in Law and Justice at the University of Illinois at Chicago, says crime is lower where people say they feel more attached to the neighborhood, more social connectedness, more responsibility for what goes on around them and a greater willingness to intervene when they suspect criminal activity. “Neighborhoods are everything” when it comes to selling your home, says Lovinda Beal, a real-estate agent with Coldwell Banker Northern California. As property values rise, a strong neighborhood adds to the home’s value; when sales are slow and prices flat or dropping, homes hold value better in strong neighborhoods, she says. Help with your home-repair projects. In spite of the many benefits of building strong communities, it usually takes threats — particularly crime and land-use proposals — to galvanize a neighborhood, says Elton Gatewood, president of Neighborhoods USA, a national group of organizers from local governments and neighborhoods. [Side note: Nextdoor membership initially ramped up due to the widespread and grassroots opposition of the San Marcos Highlands development]. In Tonya Hamilton-Nisbet’s Madison, Wis., community, neighbors became fed up with a county road on which drivers sped “like somebody set their underwear on fire.” At a public meeting about the road in 2005, residents decided to revitalize their defunct East Buckeye Neighborhood Association. They went on to persuade the city to install a stop sign near a school crossing. The group still works on traffic calming, participating in an annual, citywide campaign to get drivers to slow down and publishing occasional pleas to residents in its quarterly newsletter. The association also expanded its reach, holding annual garage sales and summer picnics, contributing to food bank drives and a handicapped-accessible school playground and helping kids pay for school field trips. “It doesn’t even take a lot of people,” Hamilton-Nisbet says. Recently, East Buckeye and seven other Madison neighborhoods won a Neighborhoods USA award for their multiyear effort to revitalize Madison’s neglected Stoughton Road. In Bellingham, Wash., a convenience-store owner in the Columbia neighborhood was shot in the face during a robbery in 2006. (The owner lived.) “Somebody said, ‘We cannot let this go on in the neighborhood,’ ” neighborhood activist Flip Breskin says. Neighbors spread the word to shop at the store and leave a donation for the shopkeeper’s family, who lived in the same building. A homeless man pitched in to clean up the damage from the shooting. Then the newspaper picked up the story, and so many shoppers arrived that a line stretched around the block. A big food chain sent inventory to stock the store and donated employees to help. This illustrates how a close neighborhood can circle the wagons in the event of a tragedy, Breskin says. A neighborhood is much better able to respond to a threat, however, if an informal social network already is in place. Otherwise, “you’re behind the eight ball,” Walljasper says. Loose as their organization was, when the city unveiled plans to widen a neighborhood street — the effect would have devastated neighborhood property values, Walljasper says — the potluck club sprang into action. Because members’ bonds already were strong, they could act quickly. They not only stopped the street plan, they went on to launch an effort that, 15 years later, got the city to narrow the controversial street. Walljasper says that, had their informal network not already existed, the powerful streets department would have prevailed before neighbors could get organized. Even if no big threats are galvanizing your neighborhood to come together, there are other ways to get started. And even when you move into a close neighborhood, it can take a little effort to break in. In Bellingham, Breskin set about in a determined way to meet her neighbors when she and her husband moved into the long-organized Columbia neighborhood on Halloween in 1999. They put on costumes and went house to house introducing themselves, handing out notes with their names, phone number and e-mail address. They took down neighbors’ names and numbers, too. Nothing much happened all winter. In spring, Breskin, who teaches music at home, kept an eye out for neighbors gardening. “If I could, I pulled on my boots and coat and gloves and hunkered down next to them and started weeding. The first reaction was, ‘Who is this nut?’ But people do not turn you down when you help them weed.” Since then, she’s become a central figure in her neighborhood. 1. Start next door. Knock on the doors of your nearest neighbors and introduce yourself. Learn their first names. You might want to make up a small list of names, addresses, phone numbers and e-mail addresses. Print copies and distribute them to each household to post on the refrigerator or near the phone. You don’t have to like everyone, just be able to wave and say, “Hi.” The rest will take care of itself. 5. Focus on safety. Research suggests that knowing neighbors helps prevent crime, says Rosenbaum, the criminologist. In laboratory studies, witnesses to crime were more likely to intervene or call police when they knew the environment or the victim or other witnesses. Start a Neighborhood Block Watch, a national police-citizen crime-fighting program, by calling your police department and asking a speaker to explain the program and train neighbors. You’ll learn to spot and report signs of crime and coordinate neighbor-to-neighbor communications. (The National Crime Prevention Council explains more here.) Another crime-fighting program teaming neighbors, police and local merchants is National Night Out, sponsored by the National Association of Town Watch. Neighborhoods hold parades, flashlight walks, cookouts, block parties and other events with a public-safety focus. You can designate a special “Project365” to tackle – eradicating graffiti, for example, or cleaning up a dangerous park. In Breskin’s neighborhood, when a drug ring was burglarizing homes, police showed residents how to reinforce deadbolts so doors couldn’t be kicked in and urged people to report the slightest suspicious activity. Eventually, someone spotted a light on in a home where residents were known to be gone, and phoned police, who busted the ring. 7. Start a publication or e-mail list. There are many approaches to neighborhood communications. Whatever you do, keep names and addresses strictly confidential. On group e-mails, put addresses on the BCC: (blind copy) line so they can’t be seen. Also, Breskin advises against unedited community forums, as they can become a platform for neighborhood feuds. She uses e-mail to distribute a weekly newsletter and occasional alerts to 900 of the 1,700 households in her neighborhood. She includes news about developments, community meetings, city government issues, hospitalized neighbors, lost pets, houses for rent and for sale and other goings-on. She takes no money and sells no ads. Neighbors give her their addresses and she guards them fiercely. Madison’s East Buckeye Neighborhood Association, which Hamilton-Nisbet helps run as co-president, uses a Web site and distributes a four- to six-page quarterly paper newsletter (no e-mail) to all 770 households whose addresses were purchased from the city and are treated as confidential information. Businesses buy ads, which cover costs. Other neighborhoods around the country use i-neighbors, a free social-networking site, for communicating; sharing photos, directories and documents; conducting polls on local issues; reviewing neighborhood businesses; and faxing government officials. The site is run by professor Keith Hampton and his students at the Annenberg School for Communication at the University of Pennsylvania. They track the site’s usage patterns for research purposes. 9. See what’s cooking at city hall. See if your town has a department or office of neighborhoods – usually found in the planning department. Tallahassee, Fla., for instance, has a council of neighborhood associations, Las Vegas has a neighborhood services department and Austin, Texas, has a neighborhood resources office. Some cities sponsor neighborhood councils, newsletters and celebrations, give grants and listen carefully to neighborhood voices, especially about land use, transportation and zoning. In Seattle, the city’s reLeaf program gives neighborhoods free trees and encourages residents to adopt and plant traffic circles and parking strips, build trails and restore native habitat. 10. Focus on disaster preparedness. Many neighborhood groups across the country are training to take care of themselves during a disaster, with the understanding that in major emergencies, it may be hours, days or weeks before overwhelmed emergency personnel can help. Neighborhood group training is offered by the American Red Cross and the Homeland Security CERT (Community Emergency Response Teams) program (search for a CERT program by ZIP code). Contact your city or county department of emergency services to learn what’s available near you. See the National League of Cities’ publication Preparing for Pandemic Influenza. The National Pedestrian Safety Campaign and the National Center for Safe Routes to School help communities improve pedestrian access. The Institute on Traffic Safety has a searchable online database of information about traffic calming. Many state and local governments encourage citizens to help build trails and footpaths. This Texas Department of Health Services manual (.pdf) tells how to organize, plan, construct and promote a community walking trail. The Active Living Resource Library has articles telling how to promote biking, walking and safe routes to school in neighborhoods. For example, hold a bicycle rodeo. 12. Focus on kids. Neighborhoods have a great effect on children’s lives. And neighborhoods that are safe and attractive for children boost property values. Neighborhoods organize to build swimming pools and offer day care, after-school programs, arts and recreation classes and computer labs. Check out offerings for children in Seattle’s Phinney neighborhood. Algiers Point neighborhood, in New Orleans, has a children’s organization, Confetti Kids, that sponsors or supports play groups, arts classes, parks, a food drive and a holiday toy drive. Madison’s Waunona Neighborhood Association raises scholarship money so all children can attend the neighborhood summer camp for children.